← Chris Hedges argues that corporate commodification of our natural resources and human capital will continue unabated. Transcript and video. AMY GOODMAN: This is Democracy Now!, democracynow.org, The War and Peace Report. I’m Amy Goodman. As we continue our conversation with Pulitzer Prize-winning journalist Glenn Greenwald, we turn to the U.S. presidential elections and the growing questions surrounding Hillary Clinton and the Clinton Foundation. On Sunday, Democratic National Committee interim Chairwoman Donna Brazile defended Clinton’s meetings as secretary of state with Clinton Foundation donors on CBS’s Face the Nation. DONNA BRAZILE: When Republicans meet with their donors, with their supporters, their activists, they call it a meeting. When Democrats do that, they call it a conflict. It’s not pay to play, unless somebody, you know, actually gave someone 50 cents to say, “I need a meeting.” No, in this great country of ours, when you meet with constituents, when you meet with heads of states, when you meet with people like Bono, who I love, you meet with them because they have a—they want to bring a matter to your attention. That’s not pay to play. It’s called that when Democrats do it; it’s not called that when Republicans do it. AMY GOODMAN: Donna Brazile’s comments come in response to an Associated Press investigation revealing that while Hillary Clinton served as secretary of state, more than half of the private citizens she met with during the reporting period had donated to the Clinton Foundation. The AP investigation comes after a three-year battle to gain access to State Department calendars. The analysis shows that at least 85 of the 154 people Hillary Clinton had scheduled phone or in-person meetings with were foundation donors, not including meetings Clinton held with U.S. or foreign government workers or representatives, only private citizens. And these 85 donors contributed more than $150 million to the Clinton Foundation combined. The AP investigation has faced criticism for excluding Clinton’s meetings with U.S. and foreign government officials, which some say present a skewed view of her activities while secretary of state. But in a statement, the Associated Press defended the investigation, writing, quote, “It focused on Mrs. Clinton’s meetings and calls involving people outside government who were not federal employees or foreign diplomats, because meeting with U.S. or foreign government officials would inherently have been part of her job as secretary of state,” unquote. This all comes as a federal judge has ordered the State Department to set a timetable for the release of 15,000 additional emails the FBI has collected during the agency’s investigation into Clinton’s use of a private email server. 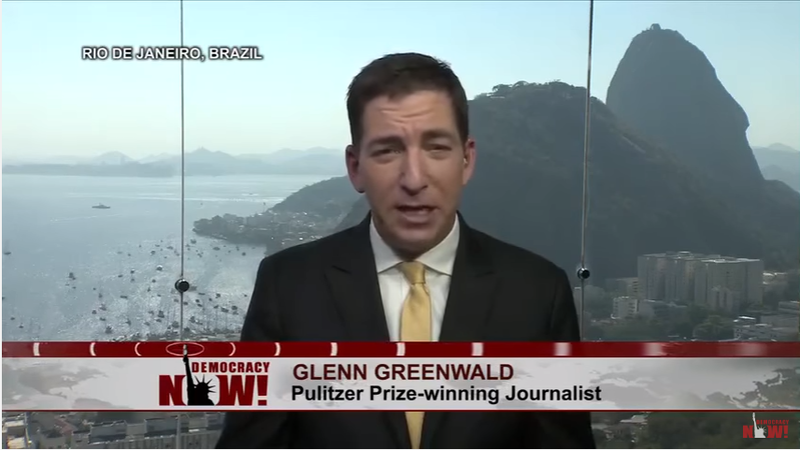 For more, we continue our conversation with Pulitzer Prize-winning journalist Glenn Greenwald of The Intercept. He has been closely following the U.S. presidential elections. His recent piece, “Why Did the Saudi Regime and Other Gulf Tyrannies Donate Millions to the Clinton Foundation?” So, Glenn, your response? GLENN GREENWALD: Well, I mean, the problem here is that the context in which this is all taking place is that the Republicans have nominated this truly unstable, dangerous and often terrifying person who obviously should never get anywhere near the White House. And so, there seem to be a lot of people, including in journalism, who think that because that’s the case, the Democratic nominee, who has all kinds of flaws and vulnerabilities and ethical clouds surrounding her, should sort of get to waltz into the White House free of challenge or questioning, because somehow it’s our civic and moral duty to make sure that Donald Trump loses the election. And although I do think that Donald Trump getting anywhere near the White House is very dangerous, I also think it’s very dangerous to allow someone to gain extraordinary amounts of political power, even more than they already have, without being challenged or questioned by an adversarial media. The role of journalists should be to shine a light on both of them. And there’s a lot of light to be shined on what Bill and Hillary Clinton had been doing in terms of unifying private wealth and oligarchical financing and enormous amounts of political power in ways that blur every single conceivable ethical line. And what Donna Brazile said in that video that you played is nothing short of laughable. It’s not questioned when Republicans do favors for their donors? Of course it is. In fact, it’s been a core, central critique of the Democratic Party, both Barack Obama and Hillary Clinton, for years, that Republicans are corrupt because they serve the interest of their big donors. One of the primary positions of the Democratic Party is that the Citizens United decision of the Supreme Court has corrupted politics because it allows huge money to flow into the political process in a way that ensures, or at least creates the appearance, that people are doing favors for donors. And so, the problem here is that the Clintons have essentially become the pioneers of eliminating all of these lines, of amassing massive wealth from around the world, and using that to boost their own political power, and then using that political power to boost the interests of the people who are enriching them in all kinds of ways. And of course questions need to be asked, and suspicions are necessarily raised, because this kind of behavior is inherently suspicious. And it needs a lot of media scrutiny and a lot of attention, and I’m glad it’s getting that. AMY GOODMAN: Let me go to Paul Glastris, who is the editor-in-chief of the Washington Monthly, and he was President Bill Clinton’s chief speechwriter from ’98 to 2001. I want to go to his comments. PAUL GLASTRIS: The reason the Clinton State Department and the entire Obama administration was willing to give a lot of arms to the Saudis and the Bahrainis was that they were tubing the Saudis and the Bahrainis by trying to open negotiations with Iran. Everybody knows this. It’s not—we don’t need to kind of find some nefarious payoff in order to understand the policy. You can agree with the policy or disagree with the policy, but if you’re in favor of the opening of Iran, it’s hard to say they shouldn’t have sold these arms to the Sunnis. They were trying to keep a balance of power going in order to bring some kind of peace and resolution of these nuclear issues. AMY GOODMAN: So that was Paul Glastris, when he had a debate at the time on Democracy Now! last week with David Sirota of International Business Times. But your response, Glenn? GLENN GREENWALD: What an intellectually dishonest hack that guy is. Just think about what you just heard. So this is a former Democratic operative, who now is the editor-in-chief of a liberal magazine, the Washington Monthly, and what he is doing is he’s looking into the camera and speaking into his microphone and justifying selling arms to the worst regime, or one of the worst regimes, on the planet, which is the Saudi regime, because he needs to do that in order to defend the Clintons. That is what the Democratic Party has become. He is in the position of having to justify extraordinarily immoral behavior. The Saudis are currently using those arms, that were funneled to them by the United States government, approved by Hillary Clinton, to obliterate Yemeni children and Yemeni civilians for over two years now with the direct help of the United States government. And he is justifying that as some sort of magnanimous desire on the part of the Clintons to bring about world peace by forging a deal with Iran. The reality is, is that the Democratic Party and the Republican Party have been funding the Saudis for decades, long before that nonsensical excuse was even available about trying to facilitate the Iran deal, and at the very same time, the Saudis are feeding millions and millions and millions of dollars to the Clinton Foundation, enriching and empowering the Clintons in all kinds of ways. It’s a case of the Clintons and the world’s worst despots scratching each other’s back and doing favors for each other, while Democratic propagandists, like the one we just heard from, justify it as some sort of magnanimous gesture. And this has really become the problem, which is, you have—there was all this talk over the last two weeks about the dangers of letting the media merge with a political campaign, when Donald Trump hired the chairman of Breitbart. And yet what you have is huge numbers of media outlets that are liberal media outlets, that are—exist for no reason but to serve the Democratic Party and their political leaders. They justify every single thing they do. They defend them from every single criticism that exists, without any kind of scruples or even pretense of independence. And overwhelmingly, the American media is completely on the side of the Clintons and Hillary Clinton in this campaign, and the liberals in the U.S. media are more propagandistic in defending Hillary Clinton than even her own campaign spokespeople are. And that clip proves that so, so potently. This entry was posted in Accountants CPA Hartford, Articles and tagged Amy Goodman, August 29 2016, Bill Clinton, Clinton Foundation donors, Democracy Now, Donna Brazile, Glenn Greenwald, Glenn Greenwald Asks "Why Did Saudi Regime & Other Gulf Tyrannies Donate Millions to Clinton Foundation? ", Glenn Greenwald Asks "Why Did Saudi Regime & Other Gulf Tyrannies Donate Millions to Clinton Foundation?" Transcript and video., Hillary Clinton, interview, Interview of Glenn Greenwald by Amy Irving, Paul Glastris, Pay to play, Quid pro quo, Secretary of State, The Clinton Foundation, transcript, transcript and video, video. Bookmark the permalink. One Response to Glenn Greenwald Asks “Why Did Saudi Regime & Other Gulf Tyrannies Donate Millions to Clinton Foundation?” Transcript and video. Amy Goodman is one the most delusional people I have ever met.